Frasers Commercial Trust's 1QFY9/19 DPU of 2.4 Scts was in line at 24.9% of our FY19 forecast. There was a slight uptick in committed portfolio occupancy on better take up. We maintain our HOLD call with an unchanged Target Price of S$1.50. 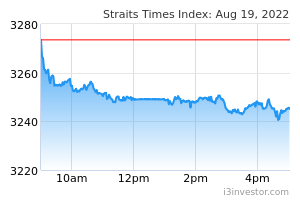 FRASERS COMMERCIAL TRUST (SGX:ND8U) reported 1QFY9/19 DPU of 2.4 Scts which was flat y-o-y. While 1Q revenue and net property income fell y-o-y, this was offset by contributions from its 50% stake in Farnborough Business Park in the UK, reduced lower interest cost and tax expenses as well as higher divestment gains from sale of hotel development rights. DPU was in line with our projections, at 24.9% of our FY19 forecast. 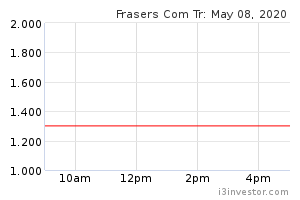 Frasers Commercial Trust's 1Q topline fell 11% y-o-y to S$31.5m on lower occupancy at China Square Central (CSC) and Alexandra Technopark (ATP), weaker Aussie dollar as well as income vacuum from the sale of 55 Market St.
Actual portfolio occupancy is at 80.7% although average committed occupancy stood at 83.8% at end-1Q. Singapore occupancy was at 75% while Australia and the UK enjoyed higher take-up rates of 90.7% and 98.1% respectively. With the committed leases secured, Frasers Commercial Trust has a remaining 10.9% and 10.7% of gross rental income to be renewed in FY19 and FY20 respectively. Most of this is at Alexandra Technopark (ATP) and China Square Central (CSC). We note enquiries for office space at Alexandra Technopark have picked up after the asset enhancement initiative (AEI) there. A recent article by Business Times cited that Google is in advanced talks to take 400k sq ft of space at Alexandra Technopark at S$4psf/mth as its current office at Mapletree Business City II is fully occupied. While management did not confirm this news, Frasers Commercial Trust indicated that it is in discussion with several prospective tenants with no certainty of reaching any definitive agreements. We have not factored this development into our forecast. See Frasers Commercial Trust's Announcement dated 17-Jan-2019. If the above take-up materialises, Alexandra Technopark’s occupancy would likely increase its committed occupancy of 68.6% to 90%. Our scenario analysis shows that on a full year basis, our FY19 DPU estimate could rise by 10.7% while our present DDM-based Target Price could rise by 15 Scts, assuming all else unchanged. Frasers Commercial Trust’s balance sheet remains robust with gearing of 28.5% at end-1Q and debt maturity of 2.6 years. In addition, 90% of its debt is on fixed rates. We believe the trust would continue to look for acquisition growth opportunities given the significant debt headroom. Our FY19-21 DPU estimates and DDM-based Target Price of S$1.50 are intact. Frasers Commercial Trust is trading at 6.7% FY19 DPU yield. We retain our HOLD rating and would look for catalysts such as increased occupancy at Alexandra Technopark and new acquisitions to spur share price further. Downside risks include longer-than-expected vacancy at Alexandra Technopark.